I played at this course years ago, and recall it as a challenging course in a lovely setting in Connecticut. It’s semi private, and at the time of writing seems to be offering pretty reasonable deals to join. 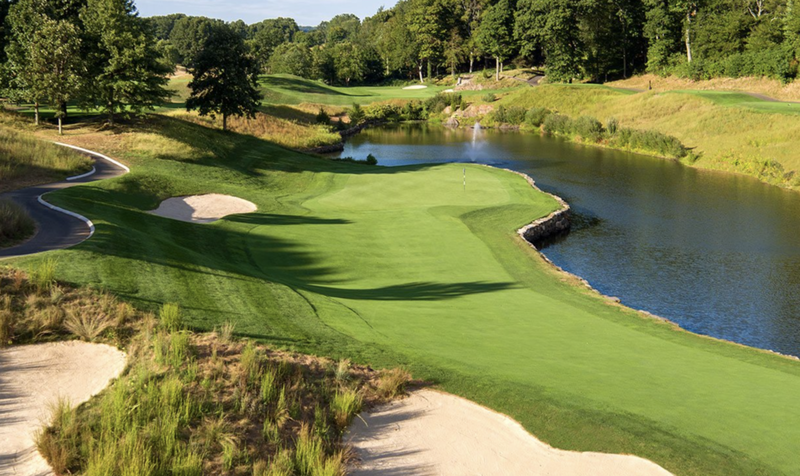 This is from the website: Built along the banks of the Housatonic River, Great River Golf Club is a Championship style, Tommy Fazio designed 18-hole golfing destination offering a first class experience for golfers of all abilities. Our Zagat rated staff will be sure you’re ready to test your golf skills on the region’s most unique and challenging golf course. From the moment you pull into our driveway overlooking our expansive practice area and clubhouse facility, your special day begins and ends with personalized service found only at Great River. Whether you are a beginning golfer or touring professional, our golf course offers five levels of tees that provide a fair yet challenging golfing experience. You’ll start on a wooded parkland style front 9 and make the turn onto a challenging modern links designed back 9 where water comes into play on each hole. Consistently ranked as one of the nation’s top golf courses, enjoy picturesque views, perfectly manicured fairways and greens and signature holes from the 1st through the 18th. A must play for any golf enthusiast. After your round, shop the latest in golf fashion in The Shop at Great River or be our guest in Monty’s River Grille – offering Zagat rated service, exceptional food and a unique dining experience. Regardless of the season, your memorable experience at “The River” will certainly not be your last!